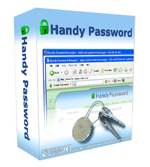 Features of Handy Password, a secure password manager. It facilitates entering of your essential information that you want to keep and protect by Handy Password manager. You can store the web-form information: passwords, logins, bank accounts, registration codes, URLs, etc, as well as any other private and valuable information: PIN codes, credit card numbers, safe ciphers, phone numbers, addresses, driving licenses and so on. You can systematize your data saved in the Handy Password manager by creating folders in the folders tree and moving cards between folders. Makes your work with Handy Password manager more comfortable. If you choose a wrong card with login information for filling in or you just want to clear the form, you can do it in one click. Allows you to fill long registration and checkout forms with help of mouse. Every user of one PC can make his/her own file with personal data in Handy Password manager that will be inaccessible for another person. Also you can create some Card Files on your profile for different purposes. Our password manager can find any card details (webmail logins, details etc.) by a single word. Handy Password manager software has keyboard shortcuts, which makes navigating the Web even more convenient. Now instead of using a mouse, you can press a key combination to fill out forms, submit information, or enable/disable the "Autosubmit" option. You can print your personal details saved in Handy Password manager. Download Password manager to manage your passwords easy.